The alert set-up is an important SMA feature that can be configured to give you feed-back when it does not find the multiplets you specify and expect. We call these “Alerts”. From the “Experiment” panel, you can configure SMA in terms of the alerts it may show. Check Relative Areas ratio: An alert is shown when the relative areas are not within the tolerance of the expected value. For example, if one range has NN=1, and another range has NN=2, then the area ratio should, in principle, be 2:1. The tolerance for this may be set, and you should consider how close you are to acquiring under “quantitative” conditions. When not quantitative, use a larger tolerance. 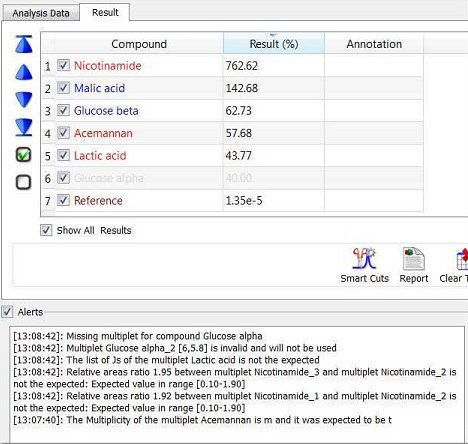 The alert is shown in red (see Nicotinamide in the example below). Check Js: An alert is shown when the found value is not within the tolerance of the expected value. The result is shown in red (see Lactic acid in the example below). The message shows: “The list of Js of the multiplet Lactic acid is not the expected”. A tolerance of ca 0.5 Hz would be typical. 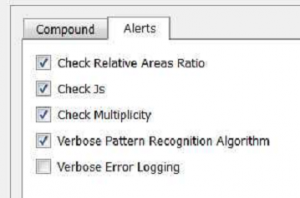 Check Multiplicity: An alert is shown when expected and found multiplicities don’t match. The result is shown in red (see Acemannan in the example below). The message shows: “The Multiplicity of the multiplet Acemannan is m and it was expected to be t”. 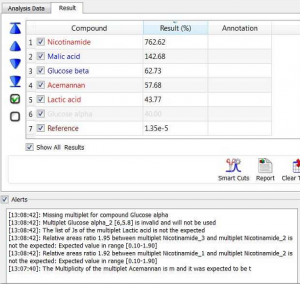 Compounds with several multiplets: an alert is shown if any of them is missing. A compound having an alert is recolored “red” in the table. 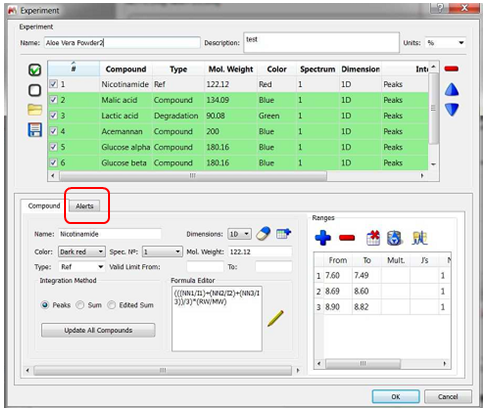 You should then check any of these discrepancies by double-clicking on that row, causing that compound to be expanded and viewed on the spectrum.